If any one thing makes it clear that the end of analog TV broadcasts really is nigh, then it’s the flood of digital tellys and tuners onto the market, especially in Japan. These days, everything from phones to car sat-nav systems now arrives speaking digital fluently. 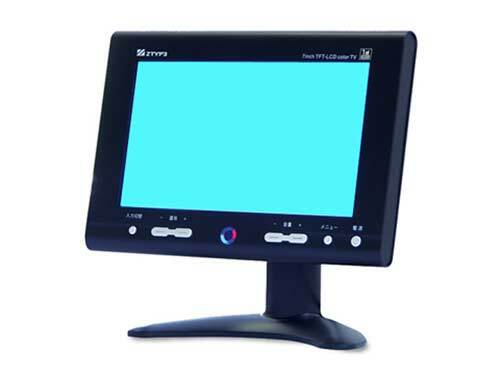 The latest addition to the 1-seg family of terrestrial digital products is a tiny 7-inch television from a trading firm known as Zox that will be available next month at the bargain price of ¥24,800. The ZTO-TV310 (the Zox creative guys were at lunch when this one was named) has a reasonable contrast ratio of 400:1, but a resolution of just 480 x 234 pixels. As with all 1-seg devices, it can receive both digital TV broadcasts and their accompanying data streams. These generally appear as tickers underneath the images and can include anything from extra information about a show to exhortations to get under a table because an earthquake is imminent. Otherwise, Zox has included an adapter for running the little nipper off a car’s cigarette-lighter socket, a remote handset, earphones and an external digital aerial.